Black Beauty, one of the best-selling novels of all time, is moving memoir of a horse named Black Beauty. Reflecting on his life from his time as a young colt in the English countryside to his life pulling a cab in the busy city of London, to his eventual retirement back in the countryside that he loves, Black Beauty reflects on both the cruelty and kindness he experienced at the hands of the humans who owned and worked him. I thought the story was amazing. It was about a hourse who had many amazing, adventurs. 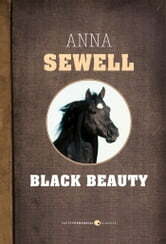 Her name was Black Beauty I LOVED IT!